Beyond the Gravity is a work that lays its foundation in ‘Art + Technology Play’ platform, which means the combination of ‘art’ and ‘digital technology.’ The work materialized a new form of art by combining sound art and media art. It employed the technique of projection mapping and using the fundamental principles of light, which expanded the limit of expression in spatial terms. At the same time, the work enables audience who experience the work to imagine unreal conditions such as zero gravity by transforming the existing space into a new visual space and making an illusion as one exists as a being floating in the vast universe. Through the visual effect that is within the augmented virtual space created by projection mapping, audiences of the work go through a confusing experience and are dazzled by such experience. In other word, the illusion experienced within the work seemingly exists by a cognitional misjudgment while it does not exist in reality. Audiences are unable to fix their vision and experience fragmentary perception. Surrounded by light, their senses make mistakes, leading them to recognize the nonexistent phenomenon as reality. 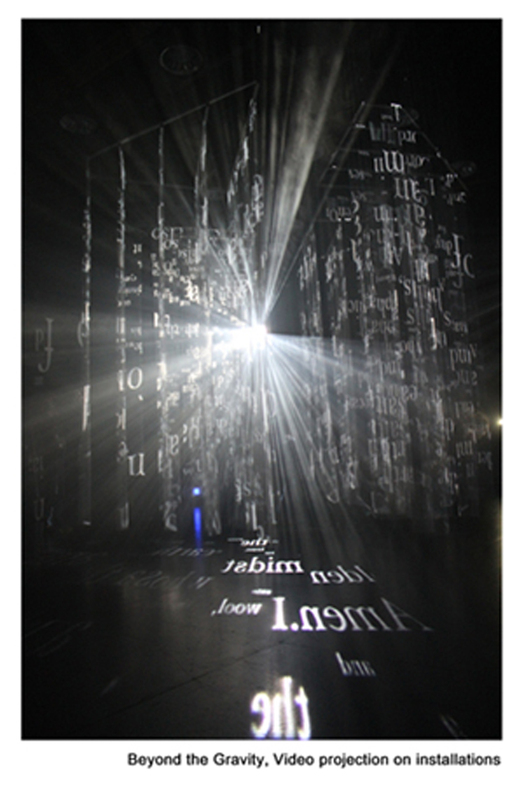 Under such context, Beyond the Gravity presents an extended space in a virtual form. The work realizes it by systemic expansion and amplification of light, which is materialized through physical partitions that are used as screens for projection. In the space created by the work, the flickering lights follow a certain rhythm, appearing as if they are traces of stars in the universe or radioactive particles floating in the atmosphere. While they are moving in a very delicate manner, the fine particles interact with sound and represent the dramatic emotion in the work. ASIA2013_Cho_Beyond Gravity from ACM SIGGRAPH on Vimeo.